Blackstreet (often stylized as BLACKstreet) is an American R&B group founded in 1991 where the extremely gifted “residents,” consist of Teddy Riley (the inventor of New Jack Swing), Dave Hollister, Mark Middleton, & Eric Williams . Their debut album, Blackstreet, was a Platinum selling success thanks to the singles such as “Booti Call”, “Before I Let You Go”, and “Joy” –released in 1994.The album peaked at number fifty-two on the Billboard 200 chart. By April of 1995, it was certified platinum in sales by the RIAA, after sales exceeding 1,000,000 copies in the United States. Their follow-up, 1996’s Another Level was a breakthrough success due to the top single “No Diggity” (with Dr. Dre), which was a #1 hit on the Billboard Hot 100 in November 1996, and won the 1998 Grammy Award for Best R&B Performance by a Duo or Group with Vocals, along with the Top 40 hit “Don’t Leave Me” which scored as a big hit. Another Level eventually went four times platinum in the United States and peaked at #3 on the Billboard chart. 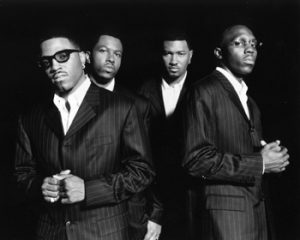 With three successful albums to follow, Blackstreet comes in at #214 of the Top 500 Pop Artists of the Past 25 Years.